I usually don't post much about real life, but when I do, it's usually a rant/complaint... so with this in mind, read on. Here in Iloilo City, there's this little-known 4-floor shopping mall known as "The Atrium" located at the very heart/center of the city. It sits adjacent to a hospital and is only a few blocks away from four other significant shopping malls here: Gaisano City, SM Delgado, Marymart Mall and Robinsons Place Iloilo. The Atrium has a 2nd floor carpark, which I happened to make use of today after dropping off my mother at the University of San Agustin. Inside the mall, I had some breakfast at McDonald's and then proceeded to make my way out of the building to buy some medicine on an errand for my mother at a drugstore a few blocks away; because everyone knows that the in-house drugstore of The Atrium sells ridiculously overpriced medicine. This is when I experienced The Atrium's militant carpark policy first-hand. You see, as soon as I set foot outside the store, an armed security guard immediately chased after me and told me that I had to take my car out as soon as I set foot outside of the building. I tried to explain that I'd already had breakfast at McDonald's inside the store (so I did have business in there) and that I was just on my way to a drugstore a few blocks away and that I would be back right away -- to which he responded (in dialect, of course) that no can do and that their policy is that you have to take your car out as soon as you set foot outside of the building -- no room for further protests/discussion. Since I knew exactly how these things worked in the Philippines, I had no choice but to comply. You see, these security guards have no discretion whatsoever in the performance of their duties as far as actual authorization goes. If that was the policy laid out by the management, all that they could do was execute it, because their powers are purely ministerial -- so to speak. Naturally, the security personnel behind The Atrium's CCTV cameras had been monitoring me ever since I'd parked the car inside the mall. This explains the prompt action taken by mall security as soon as I'd set foot outside of the store. He was probably informed via radio to take action. 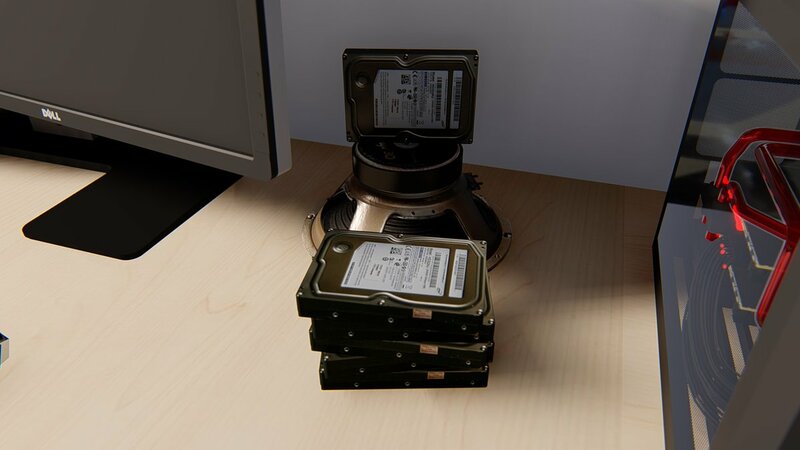 Given these circumstances, what do you think of this situation? How would you have felt if you were me? Myself, I was probably quite visibly angry even though I did choose to comply with their request without further protest. From a legal perspective, The Atrium is technically private property and belongs to whichever person or juridical entity which has ownership of the shopping mall. Therefore, they are well within their rights to enforce the carpark policy which I'd just experienced and any other policy that they may establish within the scope of The Atrium shopping mall itself. Therefore, from a legal standpoint, there was absolutely nothing wrong with what they did. From a moral standpoint, again, I have nothing to say against them. The policy is obviously in place in order to safeguard the integrity of the business and ensure that the drivers and/or the passengers inside all of the cars parked inside their carpark actually have business inside the shopping mall -- all the time. Fom a marketing standpoint, is this really all that wise of them? I am aware that this policy has been in place since time immemorial, but this is the age of social media marketing right now where even a single tweet can wreak havoc upon an established individual or business' reputation. Tell me, Atrium Iloilo, how does it look to the public's eye when you cannot even trust the people who make use of your carpark that you have to monitor every single car, driver and passenger who makes use of it and then promptly sic your armed mall security guards to single out every individual who violates your militant carpark policy? I have to commend them for their prompt action, but aren't you misplacing your priorities here? I'll admit it, my actions were not exactly morally ethical here, but again, was that really so grave a violation as to warrant the kind of positive action from The Atrium's armed mall security that I received -- making me seem like a two-bit pickpocket? I'm sure I'm not the only one here, so have any one of you out there reading this ever experienced this kind of treatment from The Atrium's mall security? I won't ask you to take my side if you would prefer to take the morally high ground here, but I will ask you to think and reflect -- how would you feel in my situation? In my case, I'm never setting foot in The Atrium again, nor do I need to ever buy anything from them and their satellite Iloilo Supermart branches anywhere else in Iloilo City. A multi-million peso business like theirs certainly would not suffer from the loss of a single individual with an earning capacity of approximately less than half a million annually, and I certainly do not need to buy any of the goods offered within their grocery and in-house stores/stalls specifically from within their establishment/s. This is how I enforce my personal principles -- so tell me, what would you do in my situation? Just let it go and be as passive as everyone else when something clearly does not sit well with you? Unfortunately, no one really cares that much. Synopsis: Chiharu points out the obvious that despite the happy-happy ending that Hayate got, he still didn't get the King's Jewel required to win back Nagi's inheritance. Alice chimes in to say that she knows where another King's Jewel could be found, but is quickly interrupted by a scream from Nagi. This is a matter of monumental importance! 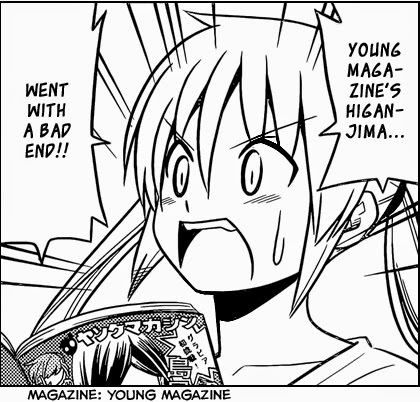 Hayate rushes over to see what's up and it seems that a manga that Nagi was reading went with a bad ending. Alice tries to continue from where she left off about her important info regarding the King's jewel; she is dead-set on advancing the plot at all costs! However, Nagi is totally uninterested and says to just send her the info on Line because she wants to watch the new Godzilla movie. 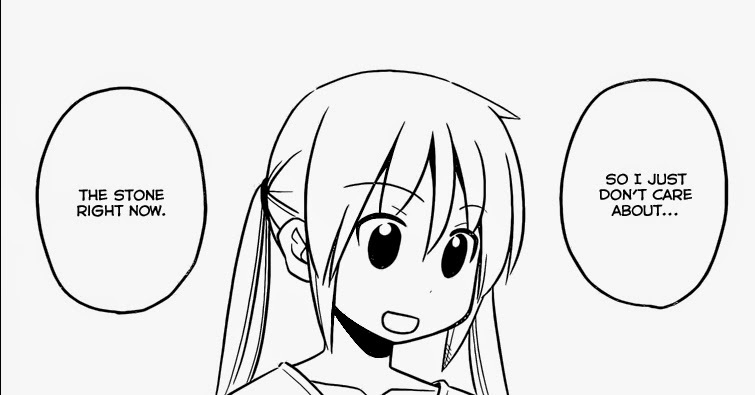 Hayate and Maria conclude that with all her delaying tactics, Nagi just wants to procrastinate instead of actually doing something productive -- even if it's something as important as getting her inheritance back. Lookit the number of ***** Nagi gives for your King's Jewel story. Chiharu and Kayura react to this bit of info because... they want to watch the movie too, of course. Alice tries to get her bit of info about the King's Jewel through once again, but no one seems interested. Maria has to go and do the laundry, Hamster has to work, Hina has to go attend to some student council affairs, and Chiharu and Kayura want to see Godzilla. Alice sulks and tells them to go see Godzilla or Gamera or whatever. Chiharu suggests they go to roponggi and to watch the movie and sample the shaved ice while they're there. Alice gets angry and Nagi suggests that they go watch the movie, eat shaved ice, while discussing the King's Jewel business at Roponggi. Alice: King's Jewels story NAO! 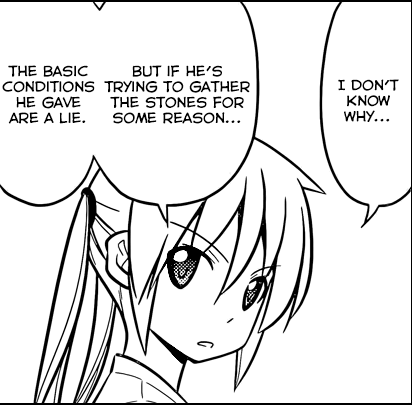 Hayate tries to pacify Alice who is on the verge of exploding from anger. 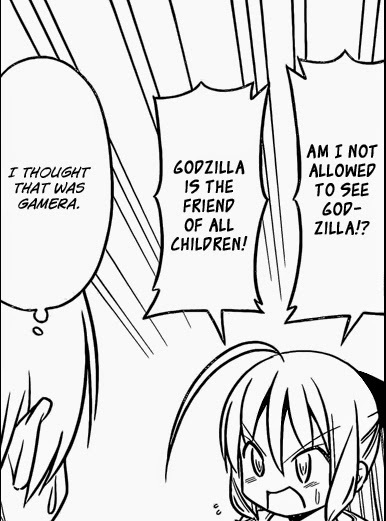 She says that she might as well see Godzilla and Hayate adds to her torment by asking her if she's going too. She responds by asking why she's not allowed to see Godzilla because he's the friend of all children. Poor A-tan and her serious business. The group arrive at the Roponggi Hills and Nagi's got a nice print on her shirt again.The place to be quite luxurious. Nagi notes that she had a movie theater at home so this is actually the first time she's seeing a movie with friends. Bawww! See what you've done, everyone? Nagi is deciding on whether to go for 2D or 3D and Hayate insists that it must be 2D and offers a fussy, long-winded explanation as to why. Godzilla is A-tan's friend! Got that? Inside the theater, Alice wants some snacks but goes about it in a roundabout way telling Hayate that he needs to purchase some. 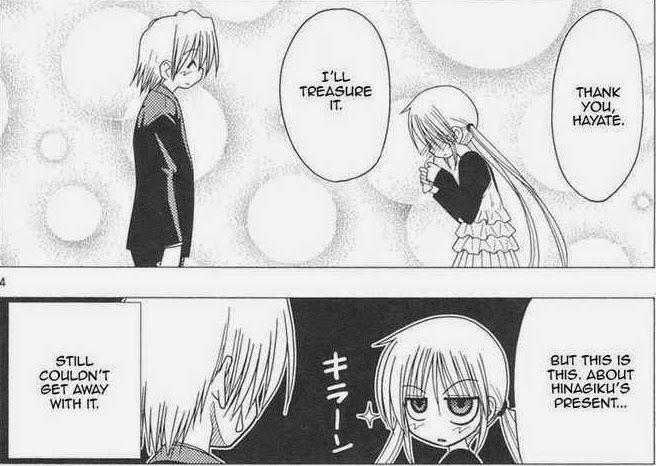 When Hayate calls her out on this and asks her if she wants it, she gets all flustered and shows a bit of her tsundere streak. Finally, the group get into the movie house and Hayate has chosen seats in the first row after the aisle for everyone because he's all fussy about movies and offers a long-winded explanation as to why these seats are the best. The movie finally begins and Hayate asks Athena if she's actually seen Godzilla and she seems to have the wrong idea about the movie. The chapter ends here. Review: The Athena fans might really love this chapter. 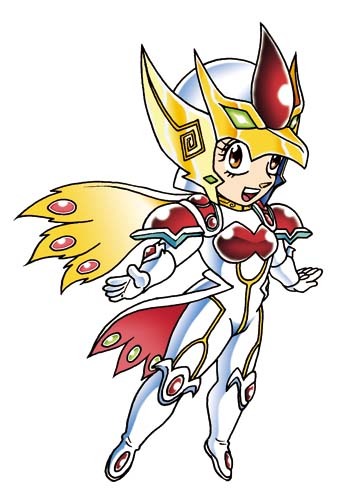 In fact, Athena really stole the show with how naturally funny her character is in her child form and when put into funny situations. Basically, this entire chapter was all about A-tan's flustered reactions when no one really cares about her serious business regarding the King's Jewel - and it works really well for the comedy factor. A-tan x Hayate shippers might also notice that this is the most amount of interaction between the two in quite a while and Hayate even sits next to her in the movie theater while Nagi is in the company of Chiharu and Kayura. In a way, it's also quite a bit about Hata projecting his thoughts onto Nagi by using delaying tactics to forestall the actual introduction of the next big story arc. As a dedicated Nagi fan, I found her expressions here really cute and funny. The new character designs actually seem to suit her quite well. 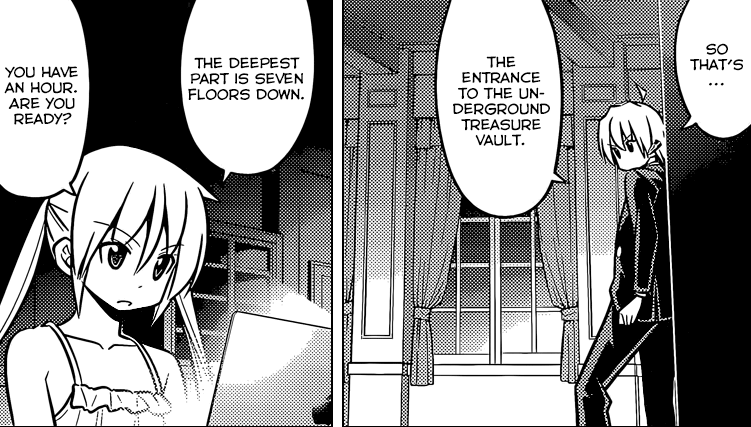 Over-all, there's not much to talk about regarding this chapter as there are no new hints about the next story arc yet except for the obvious one that it's going to be about Nagi getting her inheritance back by finding a new King's Jewel. It seems that Athena will play a role in this arc again as well. Anyway, it's a nice glimpse as to how movie theaters operate in Japan. Here in the Philippines, it's first-come, first serve as far as the seats are concerned. There are no seat numbers, just a ticket to get into the movie house and you're on your own as far as seats are concerned because the movie theaters are rarely ever packed. The top half of the theater might be full for some blockbusters, but there are usually still quite a few dozen empty ones scattered all over. Fanart Corner: Here's a little bit of Nagi fanart. 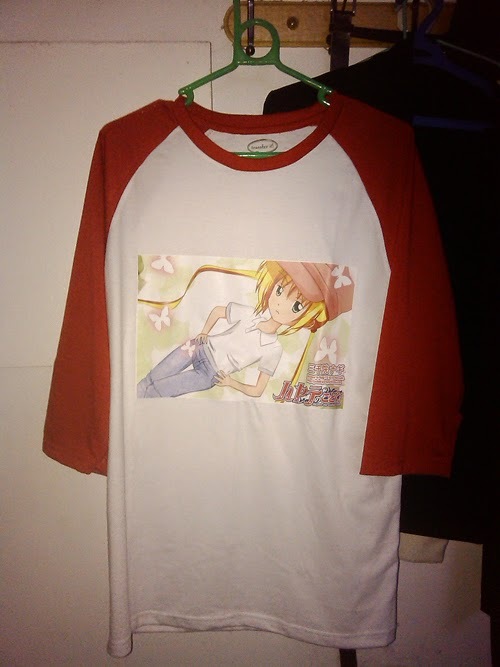 I had it turned into a raglan sleeved shirt along with another fanart of mine via a local T-shirt printing service here. The shirt comes with the print for about 7 USD each. And I'll wear it too! Synopsis: In the face of the apocalypse, Red-Hawk Scanlations comes through with another chapter of Hayate The Combat Butler, and this time, it's the end of the beach arc. 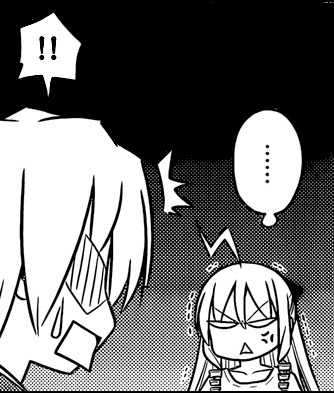 The chapter picks up where the last one left-off with Hayate being successfully rescued by Ikusa. A-tan is a little schemer. We learn immediately that it was Isumi who shot that magical bolt of lightning at the King's Jewel and that it was upon Athena's (now in Alice form) request/command/manipulation. Nagi confronts Hayate and Ikusa and confirms that her butler is fine, but Hayate is feeling down about not getting the stone. Of course, Nagi tells him that it's fine because that's not what they came here for in the first place. Just as Hayate is ready to conclude that everything is fine and that things all worked out in the end, Nagi reminds him that he still hasn't won the competition. 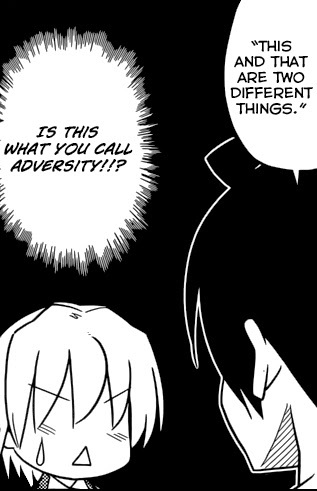 After a brief pause, Ikusa tells him that "this and that are different things," and impliedly tells Hayate that the competition really isn't over yet. 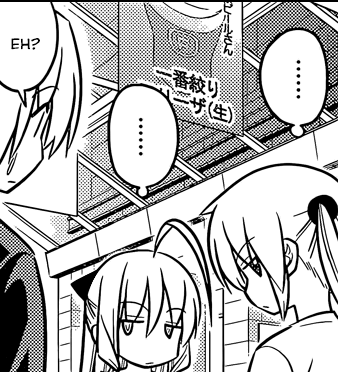 Hayate rushes off to the seaside restaurant so that he might still win this competition and Nagi has a little chat with Ikusa wherein he basically says that Hayate can win this with the power of friendship. At the restaurant, Hayate discovers that Souya and Kotetsu have already made a million yen in his absence - to his surprise. Hinagiku comes along and offers to help out and so do the rest of the Violet Mansion group. In the end, they really do somehow make 8.92 million yen with the power of friendship. Ikusa hands the pouch over to Hayate even though there was nothing inside it anymore. There was really no point to this... and Hata used the same expression and pose from Hamster like 2 chapters ago. Hamster says that it's too bad that the charm inside was lost, to which Hina agrees, but Nagi says that nothing was really lost with a satisfied look on her face. Ikusa says his goodbye, but Hayate catches up to him and hands the pouch over to Ikusa. He still won't admit that Hayate is his brother, but he does promise that he'll save Hayate just once if he ever needs his help since he's a lifesaver. Ikusa tells him to make sure not to lose what matters to him most (NAGI! 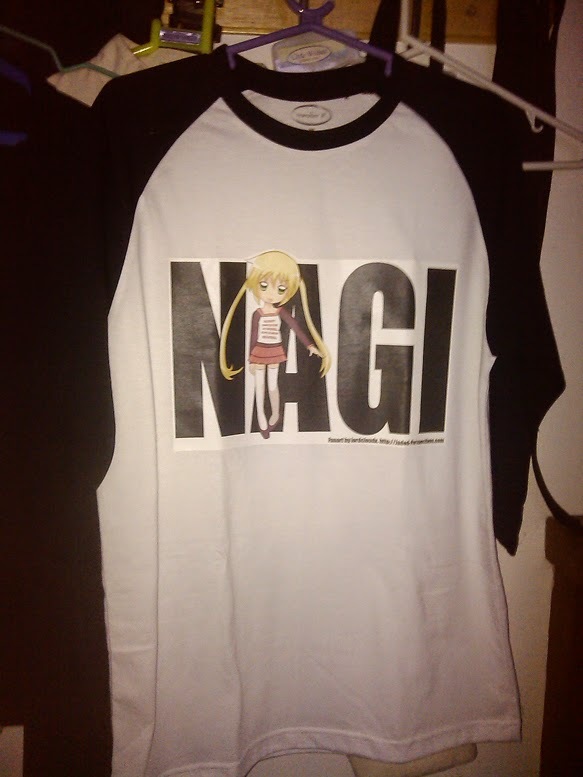 NAGI! 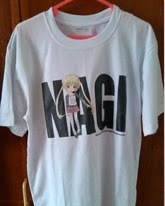 NAGI!) 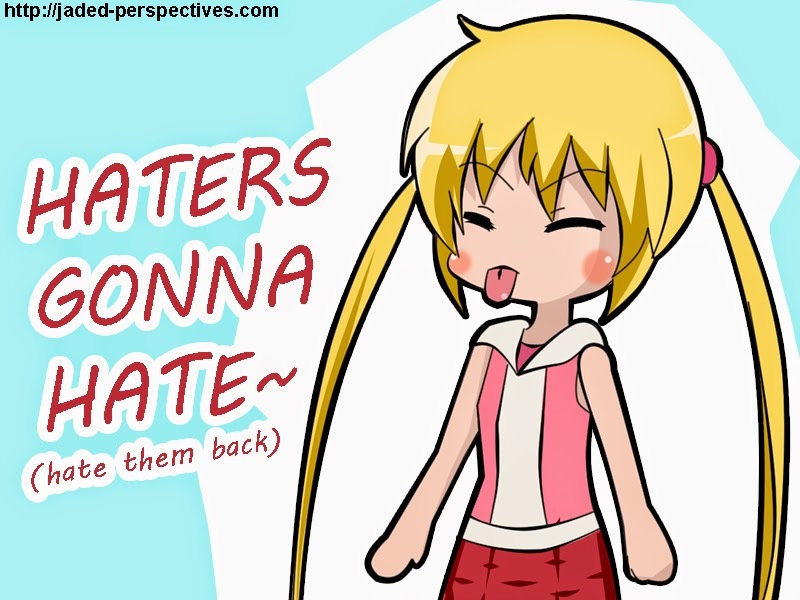 and Hayate says that he'll come back next summer. That's right, sensei. She saved you! As a lifesaver! Finally, Yukiji has somehow been saved by Fumi... as a lifesaver! Review: First, a shoutout to Chloe Noir who was absolutely correct about Isumi being the one who fired off that magical lightning bolt. As expected, the last chapter was the penultimate arc-ender, making this chapter the actual end of the arc. We have a one-week break incoming, but a new story arc to look forward to next. This is pretty exciting since we're really nearing Heaven Is A Place On Earth's timeline right now and it's just about time for the anime and manga canon to converge and silence certain elements of the fandom who still can't accept that the future anime timelines did and will happen (haters gonna hate~). Good stuff from this chapter and almost everything was resolved. Of course while the beach arc was satisfyingly concluded, the overarching King's Jewel plot has still moved just a tiny bit. 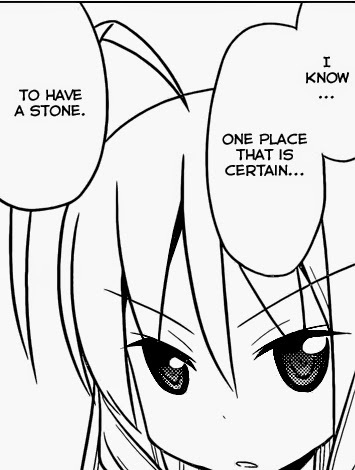 We still have no idea what A-tan is up to and what Isumi was doing with her in the first place, but we can assume that both of them do have everyone's best interests in mind -- so it's probably a good thing that Hayate's "stone of bonds" was broken. 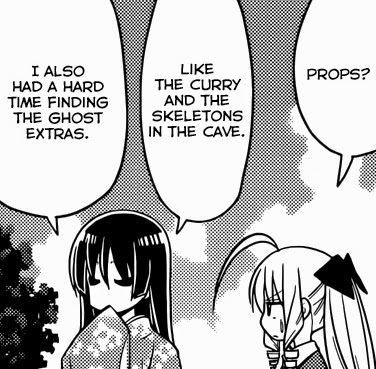 The funny thing is that even those ghost pirates and the ridiculous signs and curry boxes all over Higan island were properly explained as being Isumi's handiwork, so she was presumably the "companion" that Athena was talking about during her conversation with Ikusa. Can we also assume that "Higanman" was her doing in the first place? In that case, she really is one of the most powerful characters in this story alongside Athena. I have to say that I really disagree with Athena and Isumi's methods of "caring" for the people they love without being open to them about what they are doing. It really does nothing to endear Athena to me when I'm convinced that she's being manipulative and she seems to prove it whenever there's a serious chapter with her involved. She can she's doing it all for Hayate's sake all she wants, but wouldn't you think it would be better to let him know about it unless you have something to hide? Seems she knows a lot more than she lets on. 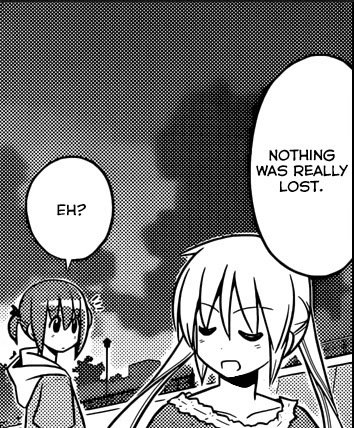 What I found interesting was Nagi's reaction to the whole incident in that she doesn't seem to mind it all that much (although we already knew she went to the beach for Hayate's sake in the first place). It almost seems as if she knew a lot more than she was letting on with her last comment saying that, "nothing was lost." Does this line look familiar? 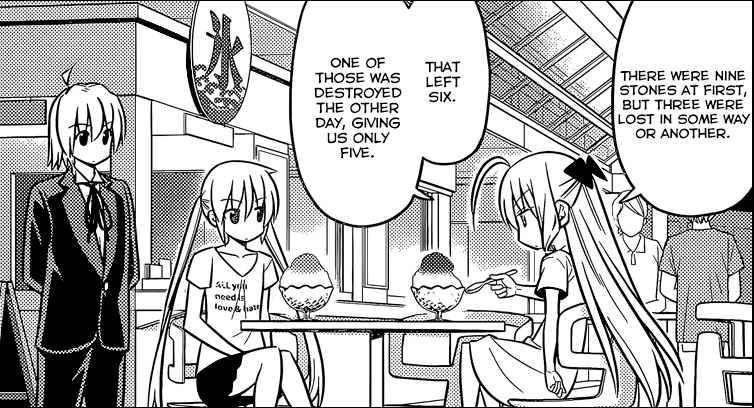 I like how one of my speculations came true about how Hayate would still win the competition with the power of friendship - and in fact, it's blatantly stated in the manga. Fumi actually saving someone at the end was a nice touch. Maybe she still has a chance with Ikusa after all? In summary, we have a sort of happy-happy ending to this beach arc with Hayate restoring his relationship with his brother and tying up some more loose ends from 10 years ago. It's also worth noting that he promised to come back next summer -- which could mean that Hata plans to make this manga last one more year? 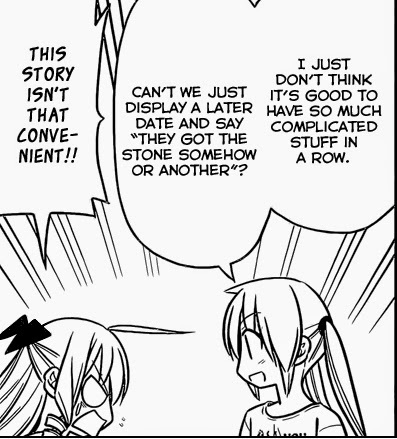 Well, maybe not, but a flash-forward is in order since he had to use one large panel just to have Hayate say that. Over-all, the beach arc was a lot of fun. 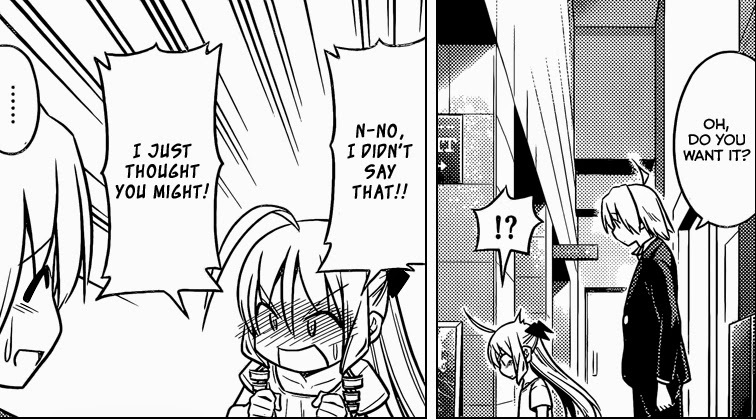 It brought together elements of Hayate's old comedic style along with the more serious tones of Ruka and Athena's arcs and is a good testament to what the manga/series has become over the years. 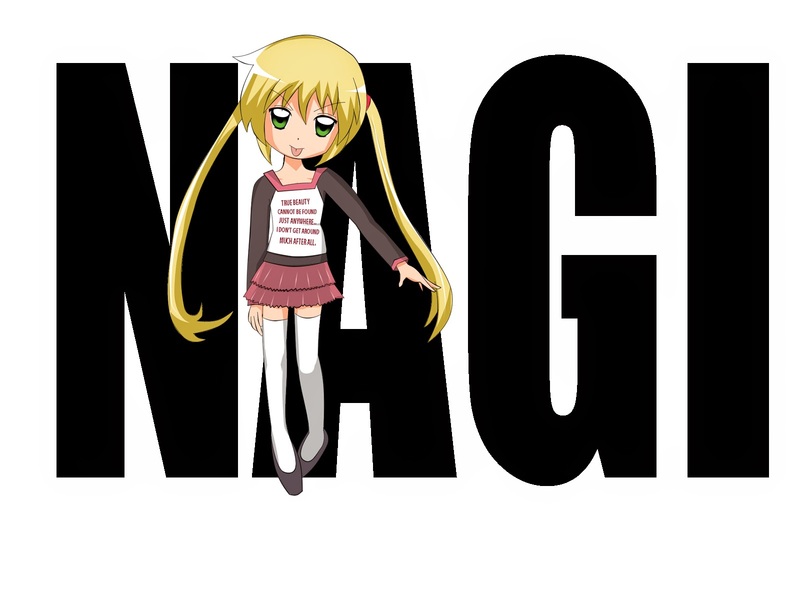 It also remains true to its shounen roots by having Hayate win the competition in true shounen manga fashion. I believe we still do have a few more days until HIAPOE, so the timelines might not converge yet in the new story, but we'll see. Fanart Corner: No speculations from me this time, but I did have some time over the weekend to draw some new Nagi fanart. 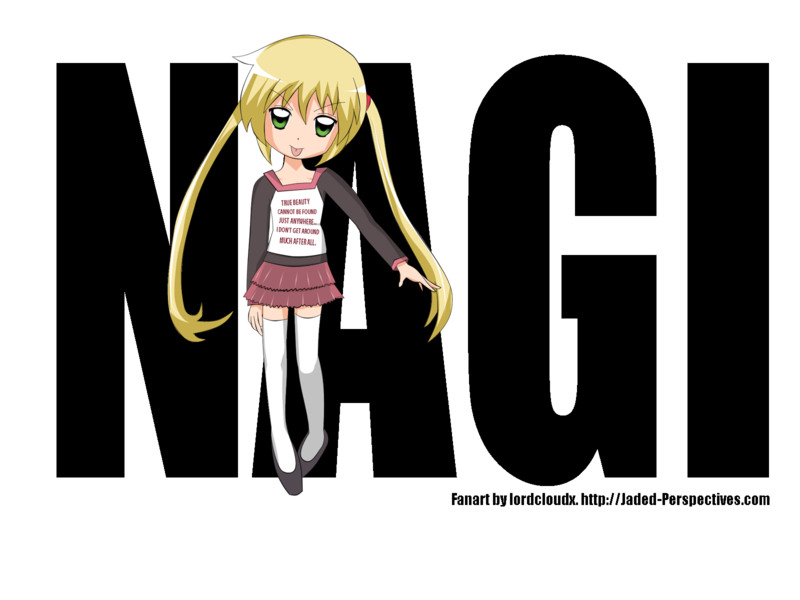 I made her body semi-chibi and this is actually designed to become a shirt... which it did. I really like the caption I included in her shirt. The playful tongue-out expression is based on some of Hata's older artworks. Click on the image and check out the caption on her shirt. Naturally, I had to turn it into a real shirt.